The following is a letter to the Santa Cruz City Council that is voting on if they should spend $2.5 million to bring a D-League team to their city. On May 11, 1987, I fell in love with the Golden State Warriors. Eric “Sleepy” Floyd went berserk, scoring 12 straight baskets in the fourth quarter to “Beat LA” singlehandedly. I was at the Price Club with my parents and got caught up in the frenzied crowd watching on a giant bank of TVs. Greg Papa lost his voice by the post-game radio show on the ride home. I’ve been a fan for life. I go to games, I watch them on TV, I gobble up box scores. It took 20 years for the Warriors to reward my loyalty a second time when ‘We Believe’ shocked the Mavericks. Now, it appears a third reward is around the corner. Two of my favorite things are about to go together like chocolate and peanut butter: Santa Cruz, meet your Warriors D-League team! I’m almost delirious at the thought (even though it’s “just” D-League)! We should do it if we’re certain the public investment will create jobs, growth and a valuable public asset to replace a “blighted” property. Is it reasonable to expect jobs and growth from investment in a sports arena? If we’re intellectually honest, we can answer this question. While gobbling up stats for 25 years, I’ve befriended a group of very smart people who study the economics of sports. 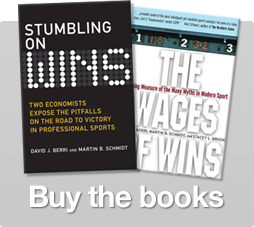 They include David Berri, author of Stumbling On Wins and contributor to Freakonomics on this very subject! What have these sports economists found that can help Santa Cruz decide? Before public funds are spent, research done by paid analysts finds economic benefits from sports that are numerous and large. After public funds are spent, independent researchers look for these benefits, but evidence of more jobs and economic growth are hard to find. The Substitution Effect — Sports are just one form of entertainment. Locals will simply spend portions of their entertainment budget (i.e. dining out, movies, etc…) on basketball instead. While the prospect of this team arriving in Santa Cruz is a dream come true for me, I also know it’s a loser economically. If we decide to commit funds, we owe it to ourselves to be honest about why we’re doing it: not because we can expect jobs and growth, but because it’s prestigious and fun. Please keep up the good work as good stewards of our city! P.S. The Warriors have no lottery pick this year. Five years ago they traded it away for Marcus Williams, a player who didn’t last even one season with the team. Berri and other sports economists discovered this happens a lot. Teams have a nasty habit of undervaluing future assets while overestimating their odds of improving (i.e. the Warriors thought they would not need the pick in five years because Williams would make them that good). I hope the City of Santa Cruz doesn’t mortgage a portion of its future by overestimating the future gains from this arena as well!